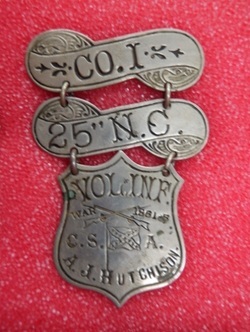 Civil War - PURPLE HEART AND MEDAL RECIPIENTS FROM NORTH CAROLINA & MORE "IF YE BREAK FAITH WITH US WHO DIE, WE SHALL NOT SLEEP"
Co.K 23rd North Carolina Vol.Inf. 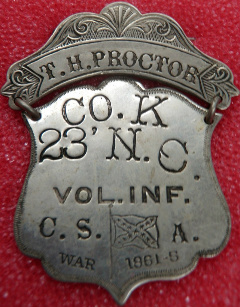 belonging to Thomas Ham Proctor.He resided in Lincoln Co.North Carolina. unspecified date.Detailed as provost guard in Nov.-Dec.1863.Reduced to Ranks in Nov.1864.Reported absent on detail through Dec.1864.Paroled at Charlotte,N.C. on May 24,1865. 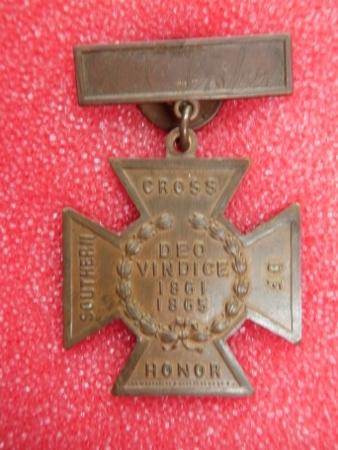 He must not have figured out that he engraved his cross upside down till it was too late. 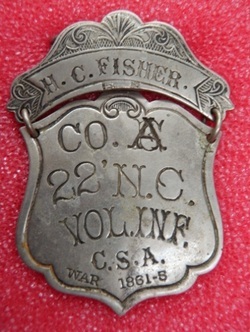 Co.E,2nd North Carolina Junior Reserves Vol.Cav. 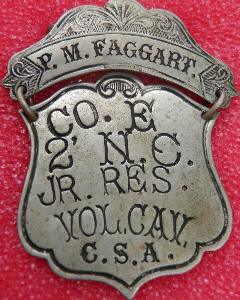 Co.E 2nd North Carolina Junior Reserves Vol.Cav. 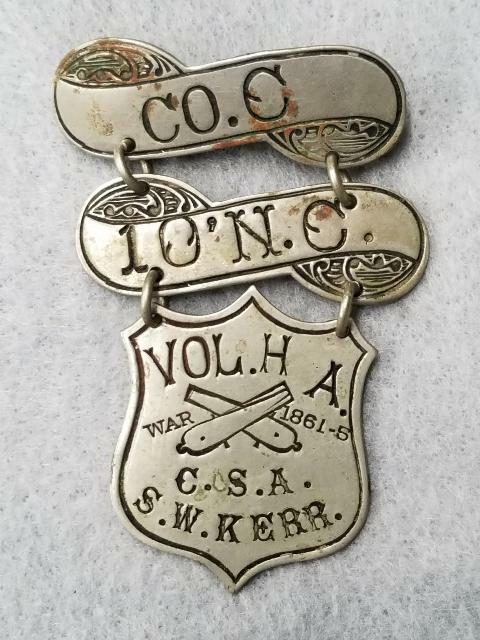 Resided in Buncombe Co. and enlisted in Lenoir Co.
March 19 1862. "Bruised from shell" at Frayser's Farm. 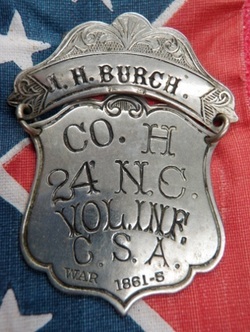 Co.H 24th North Carolina Vol.Inf. 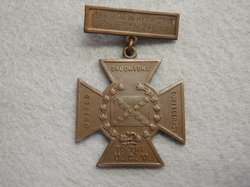 and was promoted to Corporal on June 1,1864.
or accounted for through Febuary,1865. 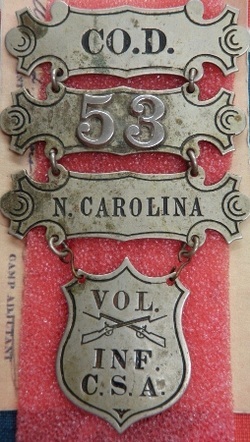 Co.D 53rd North Carolina Vol.Inf. at age 18.Elected 3rd Lt.on April 30,1862.Reported present and accounted for on surviving company muster rolls thru Febuary,1863. at Frederick,Maryland,July 6,1863.Confined at Fort Delaware,Delaware,July 10,1863.Transferred to Johnson's Island,Ohio,July 18,1863.Promoted to 1st.Lt. on November 2,1863,while a prisoner of war.Paroled at Johnson's Island on February 24,1865,and transferred to City Point,Virginia,for exchange.Paroled at Greensboro,North Carolina on May 29,1865. 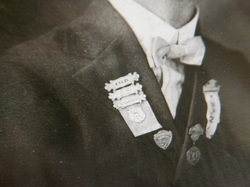 Here he is wearing his Badge. a student prior to enlisting at Camp Ellis,Virginia,July 22,1861. 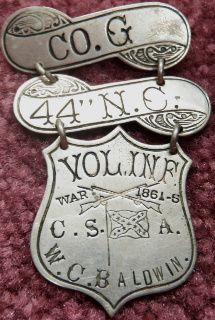 Commander of The North Carolina United Confederate Veterans on several different occasions.The below listed badges were his as Commander. district of Eastern North Carolina. RUFUS W. WHARTON, Of Forsyth county, Lieutenant-Colonel. 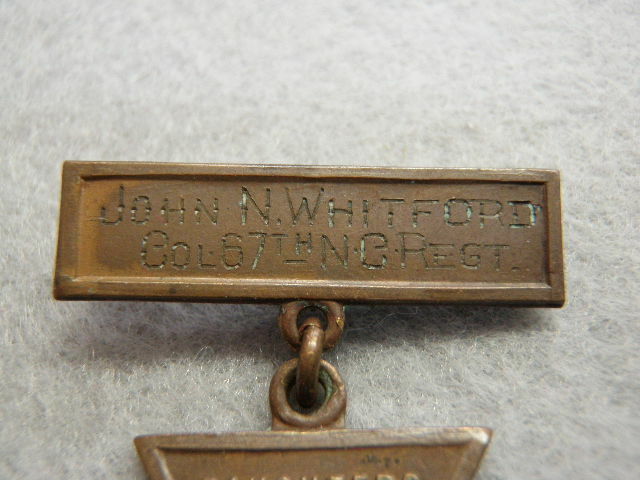 WHITFORD, Of Craven county, Major. 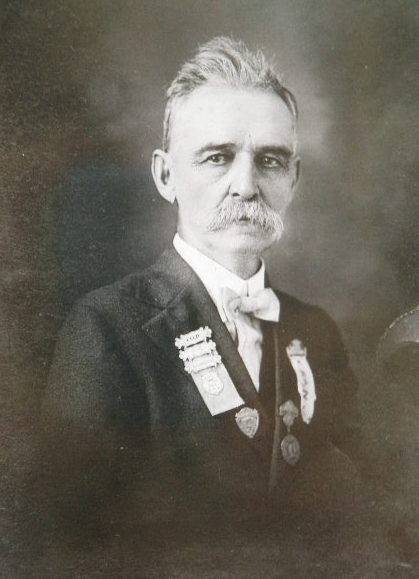 THOMAS M. ROBINSON, of Beaufort county, Quartermaster. HIGGINS, of Craven county, Commissary. to attack Fort Anderson, opposite New Bern, on the north side of Neuse river. compapy of 65 or 70 men, who were following him, Indian-like, in single file. had just won his promotion by the brilliant battle and capture of Plymouth, N.
command. He arrived in Petersburg just in time to save that city from capture. his lines and sometimes we made incursions into the territory occupied by him. confusion one of the boat's crew jumped into the river and escaped unnoticed. Confederate troops as could be spared from other points, was sent to meet him. several hundred prisoners captured, mostly by the division of General R. P.
side. On that side the river is bordered by a swamp about half a mile wide. the State and went directly to their homes. The writer with Captain J. M.
and man. May he live long and prosper. transfer to the 67th Regiment upon it's formation. under the command of Brig. Gen. Lawrence O'B. 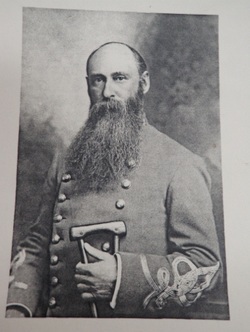 Branch, Army of the Pamlico. 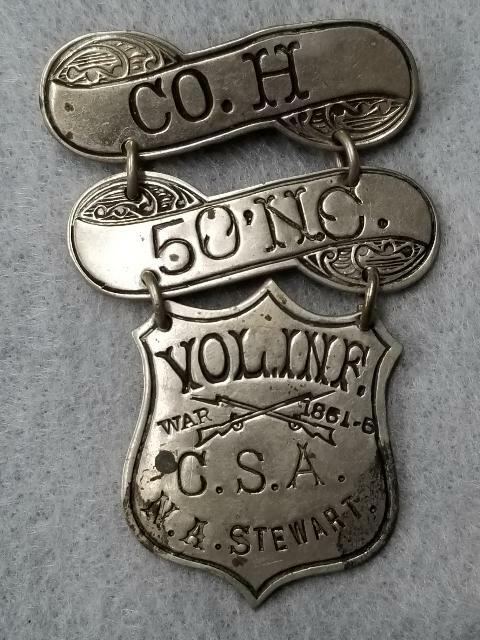 the men in Co.'s A & B at their foundation had previously served in 1st Co.
in Co. E. of the Battalion), entering State service soon after June 30, 1863. 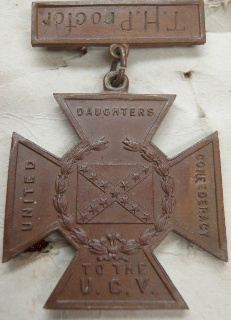 It was attached to the Battalion in July or August, 1863. 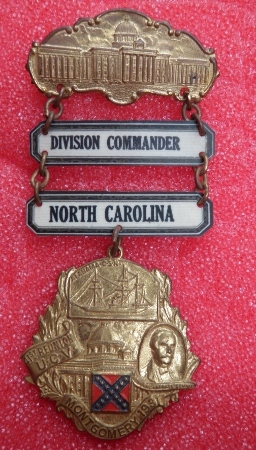 Co. H (Capt. 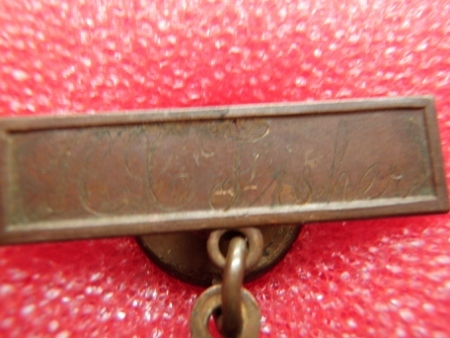 attached to the Battalion at this date or soon after. Captain White, 2nd Lt.
service" regiment from the date of it's founding until the end of the War. artillery pieces and a squadron of cavalry, attacked Tarboro NC and burned Lt.
gunboat and also a smaller gunboat and a large number of tools and materials.